Or as low as $259.99 per month over 6 months. Apply Now. The JL Audio M880-ETXv3-SG-WH tower speakers give you the best of both worlds. When you’re tearing a lake around at full throttle, you want powerful speakers that can be heard over wind and engine noise. But when you’re relaxing at the dock, high fidelity is more important than high volume. These speakers do both for you. These massive 8.8″ speakers feature oversized woofer voice coils and silk dome tweeters, so they’ll give you spectacular performance, whether you’re at the marina or miles offshore. These long-throw speakers will look great on any boat, and they’ll fit on any boat, too. They’re designed to work with JL Audio clamp systems (sold separately), which are available in a range of sizes to fit a variety of pipe diameters or surface-mount applications. The wire exits through the center of the mount, so it stays high, dry, and out of sight. Tower speakers lead a rough life, so JL Audio engineered their M880-ETXv3 speakers to exceed marine industry standards for salt water, salt, fog, and ultraviolet exposure. 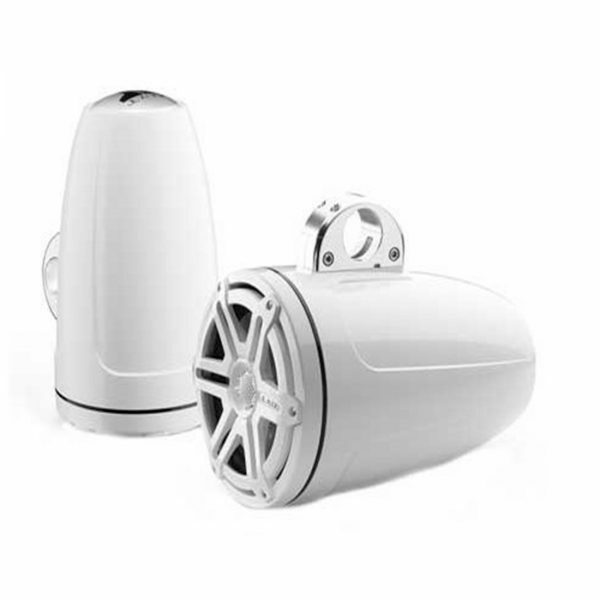 The rugged enclosures are precision-molded from marine-grade polymer and the speaker connections are hidden safely away, so your speakers will stand up to the rigors of the marine environment. With water-resistant internal works and durable rubber surrounds, these speakers won’t let a little moisture throw a wet blanket on your fun.